Today I want to talk about a great pedal from the guys at Malekko called Malekko Barker Assmaster Germanium Distortion. This is inspired by the original Maestro Bass Brassmaster octave fuzz of the 70s. They offer germanium and silicon versions, but the video I want to present demos the germanium version. Personally, I always like to lean towards the germanium side, but that just my hang-up. 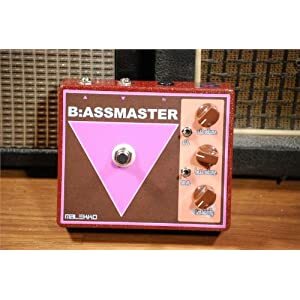 The Assmaster is a harmonic octave analog distortion, creating a fuzz with a lot of character. Bass players will love this pedal for sure. Here is a great demo by the guys at ChicagoMusicExchange (this is a great channel to subscribe to on YouTube, BTW). If you’re looking to pick up the Malekko Barker Assmaster Germanium Distortion you can pick it for $285.00 on Amazon (via Chicago Music Exchange) or if you’re looking for the silicon version, that is available for $255.00 on Amazon. If you own or have played this pedal, please comment below. It would be great to hear your thoughts! its cool to see a bass pedal reviewed(especially such a cool one!) i wish it would have been a little more in depth, i.e. full settings/switch rundown, but still very awesome to see. Thanks effects bay!